Jasper Swann is an independent consultant providing expert advice, documentation and project management services in the conservation and restoration of historic stone facades, buildings and structures. 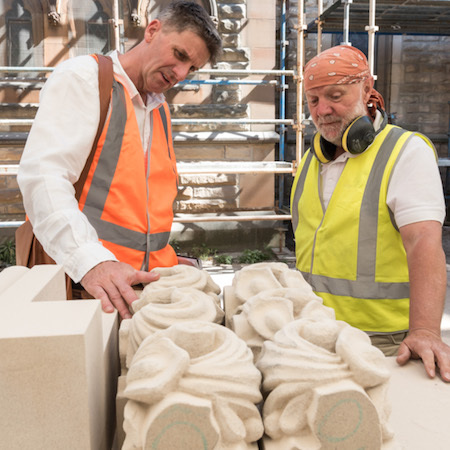 "I would like to acknowledge the City’s gratitude for Jasper Swann’s assistance with the conservation projects recently completed for the Sydney Town Hall facades. The Clocktower project particularly contained some unique stonemasonry issues including the replacement of all the capitals under the dome, seismic bracing of the dome, removal of asbestos in joints and replacement of key façade stones. Given the risks and complex nature of this project we engaged consultants direct, being Stonemasonry (Jasper Swann Pty Ltd) a Heritage Architect and a Structural Engineer." -- Geoff Brew, City of Sydney, 456 Kent St Sydney. Like to discuss your project? Use our contact form.